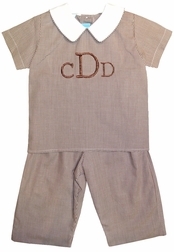 Sweet brown gingham top and pants outfit by Claire & Charlie for little boys. Top buttons down the back and is just perfect for monogramming. Wonderful for gatherings and parties at Thanksgiving and all throughout the fall and winter.